You do not have to eat meat to enjoy eating biryani. Vegetable biryani is as delicious as chicken or mutton biryani. This tasty, appetizing, spicy, vegetable biryani typically served as a complete meal with yogurt and coriander chutney. Biryani is two step processes. Rice and vegetables are cooked separate. After cooking they are put together and baked. 1. Heat 4 tablespoons oil in a pan and add length wise sliced 2 medium onions and sauté them for 10 minutes or until onions become dark brown and caramelized, take them out leaving the oil in the pan and keep them aside on paper towel for later use. 2. Fine chop 2 onions and 4 cloves of garlic in the chopper or grind them in the blender in a coarse paste. 3. Add chopped or grinded onions and garlic in the same oil onions were fried and sauté them, while periodically stirring. Onions will have a lot of water so for the first 8 to 10 minutes keep the heat high so that all the onion water evaporates quickly. 4. While onion mixture cooks add the tomato to the same food chopper or blender and puree. 5. Once the onion water has evaporated turn the heat down to medium and let the onions cook for 8 to 9 minutes, frequently stir the onions. 6. Once the onions become light brown add coriander powder, red chili powder, turmeric powder and mix with the onions and fry for few seconds. 7. Add tomato puree and yogurt. With the tomato puree and yogurt masala become watery turn the heat high for 2 to 3 minutes, so that water evaporates quickly and then turn the heat down. Keep stirring the masala frequently. In about 5 to 6 minutes tomato puree and onion will blend in together. 8. Once all the water has evaporated and you see the oil in the pan that means masala is done. 9. Add all the chopped vegetables, into masala, sprinkle 1 teaspoon salt, mix and cook for 2 minutes without adding water, stirring frequently. 10. Add ½ cup of water and mix it with the vegetables, cover the pan and Cook on medium heat for 10 to 15 minutes or until vegetables become tender but not mushy. 12. Once vegetables become tender add grated ginger, chopped green chilies, garam masala and black pepper powder mix and cook for 5 minutes or until gravy become thicker, add tablespoons chopped coriander leaves and mix, turn the stove off. Rice can be cooked two ways, either cook them with onions or boil them in plain water. 2. On medium heat in sauce pan heat 2 tablespoons oil, add onions, sauté them for 7 to 8 minutes or until the onions become dark brown, dark brown onions give nice color to rice. If you wish add bay leaves, big cardamoms and cinnamon this time and fry for few seconds. 3. Wash and drain the rice, add to the browned onions and sauté for about 2 minutes, being careful not to break the rice grains. 4. Add 2 ½ cups of water and salt, stirring gently mix with rice and fried onions, turn the heat to medium high, let the water boil, leave the sauce pan uncovered. 5. Water will start boiling in 5 minutes let the rice boil for 2 to 3 minutes, water will reduce slightly, turn the heat down to low, cover the pan and cook for about 5 to 6 minutes. 6. Turn the heat off, leave the cover on the sauce pan and let the rice stand for at least 5 to 8 minutes on the stove. 7. Do not fully cook the rice because they will cook in the oven too. Remove it from the stove so that they do not cook any more. 1. In ¼ cup of warm milk add some saffron leaves and mix. Keep it aside for later use. 2. Grease a 9 by 12 baking dish. 3. Fluff the rice with fork and gently with the cooking spoon scope them out from the sauce pan and evenly layer half of the cooked rice in the greased baking dish, if added cardamom, cinnamon, bay leaves then take them out. 4. Over the rice, layered cooked vegetables with the gravy and fried paneer pieces. Spread the vegetables and paneer evenly. 5. Spread sliced onion rings, sliced tomatoes rings over the layer of the vegetables, sprinkle some chopped coriander leaves. 6. Now add another layer of cooked rice over the vegetables. 7. 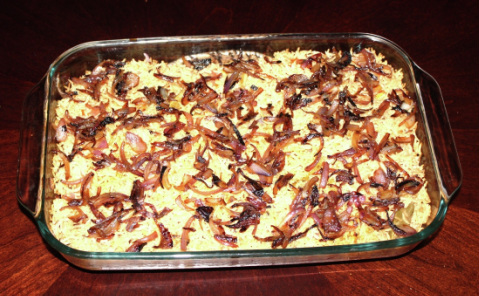 On the top of cooked rice with the spoon sprinkle saffron milk all over, and garnish with the previously caramelized onions and chopped coriander leaves. 10. Turn the oven off, take the dish out and let it sit for 5 minute, take the cover or aluminum foil off and serve. 1. Any vegetables or ingredients could be added or taken out.